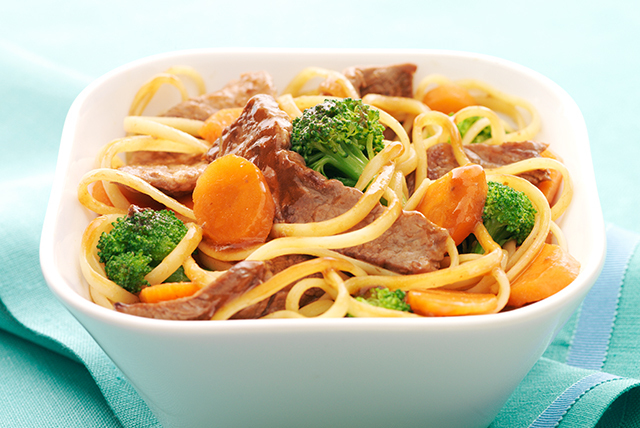 Our colorful beef noodle bowl includes linguine, sirloin steak, fresh veggies...and can be on the table in 20 minutes. Not bad for a Healthy Living recipe! Cook pasta as directed on package. Meanwhile, heat oil in large nonstick skillet on medium-high heat. Add meat, broccoli and carrots; cook and stir 4 min. or until meat is evenly browned. Add broth, hoisin sauce, dressing and gingerroot; stir. Cover. Reduce heat to medium-low; simmer 3 min. or until vegetables are crisp-tender, stirring occasionally. Drain pasta; return to pan. Add meat mixture; toss lightly. Sprinkle with 3 Tbsp. chopped PLANTERS Peanuts just before serving. Use whatever fresh vegetables you have on hand, such as chopped peppers or onions, instead of the broccoli and carrots. Substitute 1/2 tsp. ground ginger for the 1 Tbsp. minced gingerroot.